Mary Elizabeth Hamilton (1875-1956). Born Skene, Aberdeenshire Scotland, Hamilton studied at the Byam Shaw School of Art in London and lived there for a time circa 1908 before returning to Murtle in Aberdeenshire. 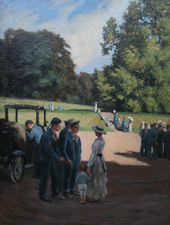 Hamilton painted landscapes, florals, portraits and figurative works in oil and watercolour. Exhibited Royal Academy 5, Royal Scottish Academy 2, Royal Institute of Painters in watercolours 2, Scottish Society of Women Artists 1, Liverpool 20, Glasgow Institute 5 and Aberdeen Artists Society 1896-1937. Hamilton is represented in Aberdeen Art Gallery.